Step aboard your spaceship as you take on the evil emperor Zerg. This slow moving Omnimover transports riders into the Toy Story universe. Grab your laser blaster and shoot the Z targets to become a Galactic Hero. Riders board an Omnimover vehicle and a cast member lowers the lap bar. You are then sent into a room without targets to practice how to move the vehicle and shoot your laser blaster. 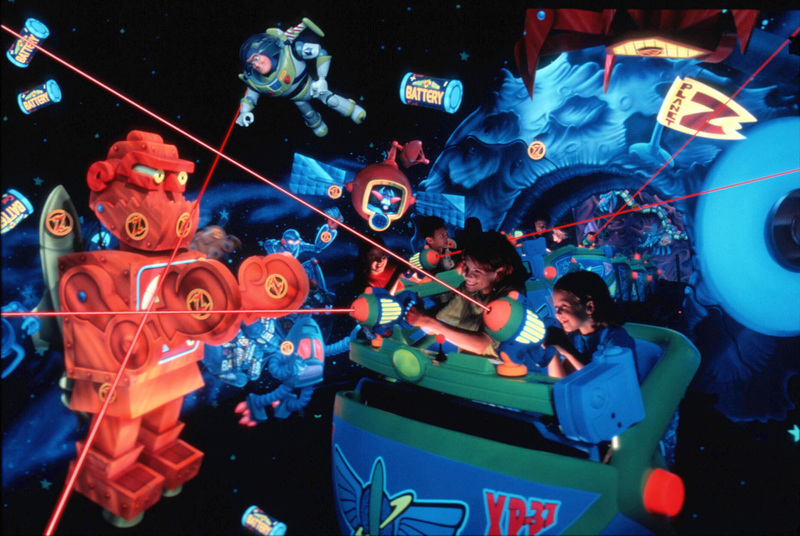 From there you are met with various scenes filled with Z targets that will help you accumulate points throughout the ride. Some points are worth more than others with moving targets generally being worth more. Towards the end of the ride you enter a tunnel with projections of space and more enemies. After this section you no longer have control of your vehicle. Your vehicle automatically will orient itself to take an on-ride photo before being congratulated by Buzz Lightyear.